Recommended to: Readers who are looking for a well written angel story! I met someone who changed everything. Matthias. My autistic sister's guardian angel. Honest. Inspiring. Funny. Hot. And immortal. That was the problem. What could I do? I did what any other girl would do-I fell in love with him. Zoe's sister darts in front of cars. Her brother's a pothead. Her parents are so overwhelmed; they don't see Zoe lost in her broken life. Zoe escapes the only way she knows how: partying. Matthias, a guardian sent from Heaven, watches over Zoe's autistic sister. After Zoe is convinced he's legit, angel and lost girl come together in a love that changes destiny. But Heaven on Earth can't last forever. When I first started reading I'll admit that Zoe drove me a bit crazy. She is a teen who is lost in life. Turning to alcohol and promiscuity to make herself feel better, Zoe feels like everything in her life is a downhill battle. I liked very much that Laurens shows the true difficulty that comes along with living with a child with disabilities. It's clear that Zoe loves her little sister, but that doesn't make it any easier to adjust her life to pretty much being a full time mom. What did bother me though, more than anything, was the way Zoe could be so selfish sometimes. Again, I understood that she is a teen who is lost. Sometimes her decisions were just so hypocritical. Matthias on the other hand is 100% angel, and one of the sweetest characters I've ever had a chance to meet in a book. He is so loving, and his affection for little Abria pours off the page. It's fairly impossible not to fall in love with this gorgeous angelic man. Zoe finds this out quickly, that's for sure. However what I also liked is that there is no insta-love here. Again, this is why Laurens is such a great writer. At the core of everything is a story about growing up, and letting go. 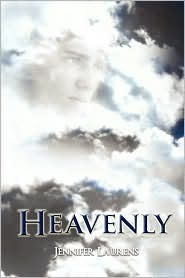 Heavenly is a bit heavy handed in the religion department, but then again it is about guardian angels. The message here is clear. Put your faith in God, and everything will work out for the best. If that is a message that you believe in, this book will be sure to delight you. If it's not,the story line still stands strongly on its own. The feelings between Matthias and Zoe alone are enough to draw you into the story. The ending, oh the ending. It broke my heart. I have no idea what comes next, although I do know that the next book Penitence is already out. I'm thinking I may have to pick up a copy to see what happens to these two wonderful characters. If you are looking for a story about angels that is heartfelt, and you are okay with some religious undertones, this is a book for you.